I'm usually happy to find my way around a city by walking, but last week in New York it was pouring . While I'd brought a heavy raincoat, I'd decided to forego an umbrella, which quickly saw me sodden from the waist down. Giving up, I eventually decided to brave the New York Subway. While the Interactive Transit Map was a helpful idea, most of the time I didn't have an Internet connection handy, so I had to resort to good old analog maps—or calling people who had a computer handy, which turned out to not work so well. I really could have used a New York Subway Credit Card map. 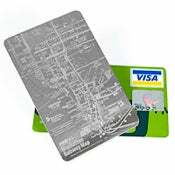 This $13 stainless steel card fits perfectly in the wallet and contains an insanely detailed map of New York's expansive subway system. I got around via subway pretty easily, fortunately, making me wish that I'd just stuck with it in the first place. That'll teach me to try and get some exercise in. For those of a more international bent, there's a version of the card for the London Underground as well.